Growing up, I am pretty sure The Great Escape (1963) was one of the films my Nan was forever watching. That and Escape to Victory (1981), or I have just confused the two and she actually only re-watched one of them over and over. In any case, if it was The Great Escape she loved, I must applaud her exemplary taste, because it is one hell of a film. The film is set in a German POW camp from where, I am sure you will be shocked to discover given the title, a group of Allied soldiers are attempting to escape. An interesting counterpoint to the portrayal of camps in most WWII films is that in this one, the inmates can actually live a relatively comfortable life. So the fact they are so desperate to escape, taps into their duty as soldiers. It is considered cowardice to sit out the war comfortably when you should be doing everything in your power to escape. Structurally, the film is a little more innovative than what you would expect from a classic, mainstream war film. Rather than just building a core narrative, we are gradually introduced to the small escape efforts made by the crack band of escape artists. The focus on this merry band of inmates, with their distinct fields of expertise, means the film functions as an inverted heist film, as the crew do their absolute best to get out rather than in. One criticism levelled at many contemporary mainstream films is the lack of stakes or tension. There are no such issues here, as the tension at the end absolutely killed me. Not to mention the fact that the film eschews the ending you were expecting, but gives you one that is a lot more true to the rest of the film and the war it is depicting a small part of. 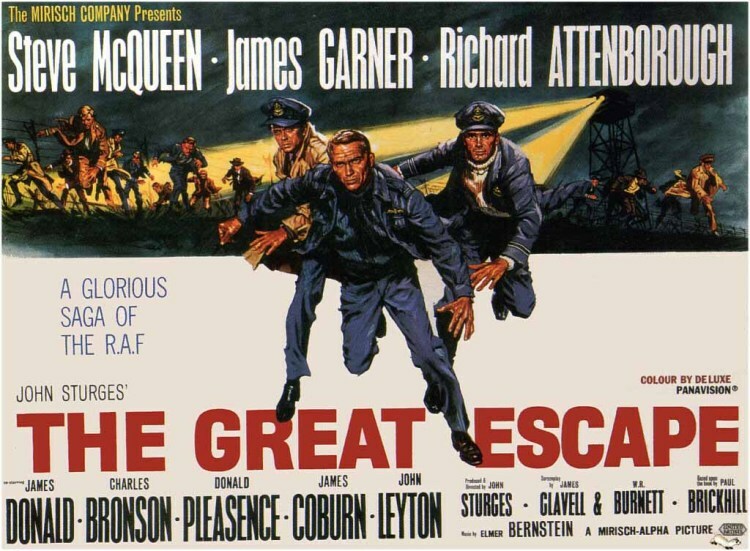 The theme song for The Great Escape is one of the best recognised in cinema history. It is firmly lodged in my head as I write this, even though I watched the film a while ago now. The song is a perfect storm of catchiness, simplicity and more than anything else fits in perfectly with the action on screen. It is employed as a refrain, popping up intermittently throughout the film and it works well in that role. 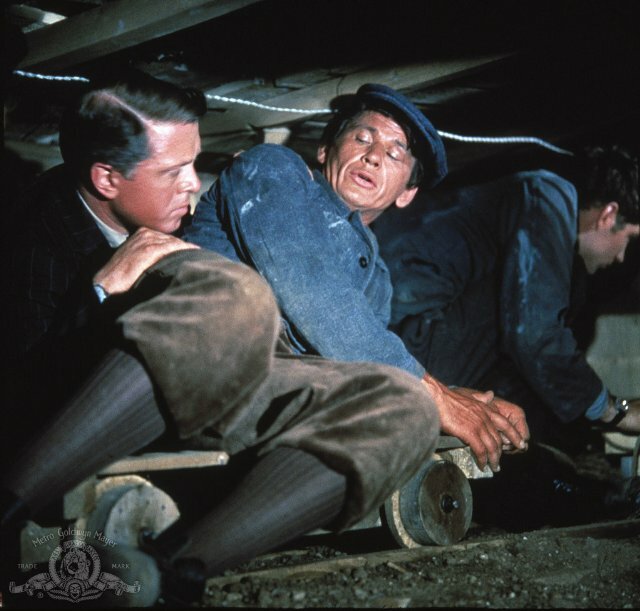 Along with the theme song, the aspect of The Great Escape which has probably lasted the longest in the public consciousness is the incredibly talented ensemble cast, led by Steve McQueen. McQueen is one of those dudes who is just instant charisma, he exudes it just walking around. Alongside McQueen is a whole host of the era’s finest actors. The late, great Richard Attenborough as the inmates’ leader, Charles Bronson whose magnetism is equally as strong yet totally different to McQueen’s and a whole bunch of other iconic stars. The characters function for the most part as ciphers or caricatures. But that is fine because the characterisation of the script is so good that even though they are slight, they still deeply involve the audience in the goings on of the film. They are almost caricatures with nuance if that is a thing. Related beermovie.net articles for you to check out: High Plains Drifter and Ben-Hur. This one has to go on my shame list of films I haven’t seen! I should definitely add it to the queue at the very least. Great review. Yeah it is a tops film. Haven’t seen Guns of Navarone. Would you recommend it? Classic war story, give it a go, it lacks the humour of Yhe Great Escape though. Awesome review, Tim. 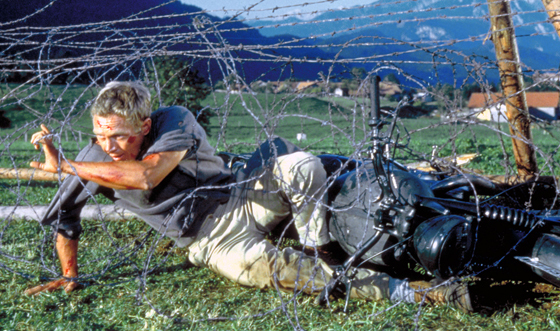 If you liked this, check out ‘The Dirty Dozen’ if you haven’t already for more of the same…. Thanks Cindy! Have never seen it, though have definitely heard of it. Good to know that you rate it so highly. Cheers for commenting Rob. Yep, pretty hard to poke any flaws in this one.